Everyone knows Bitcoin. You probably heard about it only in passing but never paid much attention. Big Mistake. You just might have missed a big chance to get rich. Bitcoin is basically an online form of currency that is fool-proof, secure and open. Unlike services like PayPal, Bitcoin eliminated the need for a bank to act as an intermediary. It works like in the physical world, where when I hand you cash, I don’t end up paying taxes or service fees. You may confuse this simplicity for weakness, but it took many years to invent the technology that runs this service – Blockchain. The reason is because by design, the internet works by sharing information. What this means is that when I send you an email, I also remain with a copy. When you read this article, you are just reading a copy of it. When you download an app, you are downloading a copy. Basically, almost everything on the internet is a copy of the original. However, currency cannot work like this. For it to have any value, you need a guarantee that when I give it to you, I have not retained a copy. You can imagine the chaos in the world if I sent you $100 on PayPal but still retain the original, which I can also send to an unlimited number of people. That would be money created from thin air. To go around this, the likes of Visa and MasterCard have to be at the centre of every transaction. Until Blockchain technology came along and is slowly eliminating them from the equation. Now when I send you 1 Bitcoin, the technology guarantees that I don’t keep a copy, hence the value is retained. 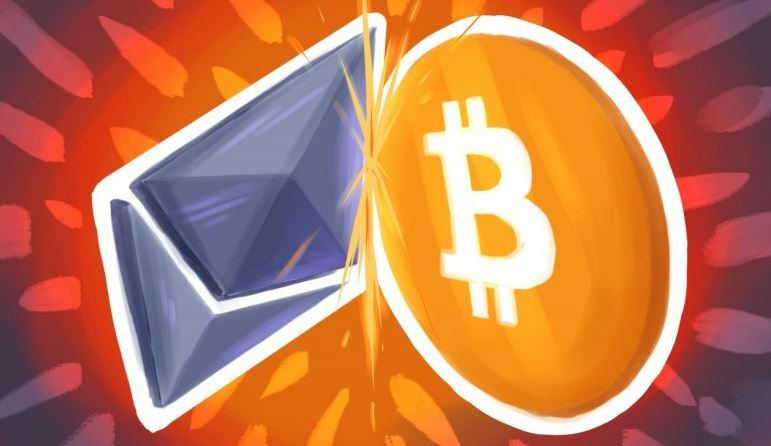 Is Bitcoin and Ethereum a Good Investment? I don’t know what a good investment according to you should be, but let’s make some comparisons. You have Sh100,000 in you bank account in January. You leave it untouched for the whole year. How much will you find at the end of the year. The interest earned on money is negligible. It’s very likely your Sh100,000 will still be that in December. Assuming you you bought some government bond like M Akiba. These are much better since you will earn 10% interest in 1 year. If you started with Sh100,000 in January, you’ll have Sh110,000 in December before taxes. Of course if you had invested Sh10 million, the returns would be much better. However, let’s assume you used the Sh100,000 to buy some Ethereum. By the time of this writing (Tuesday June 13), the price is $395. Yesterday, the price was $373. Already that’s 5% gain in just one day. 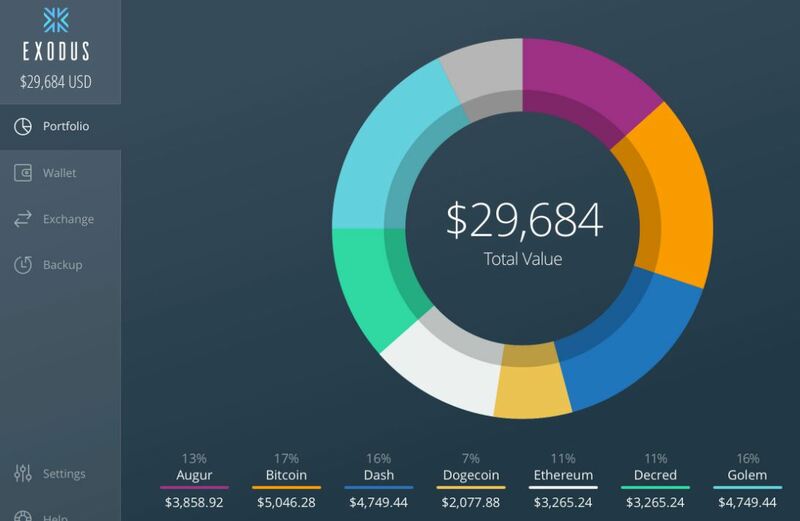 Assuming you bought Ethereum at the start of the year. On January 1, 2017, the price was $8.24. It’s simply unbelievable that the value has increased nearly 50 fold. If you started with Sh100,000 in January, you would now have close to Sh5 million. On January 1st, Bitcoin was selling at $972. Today it is going for $2757. It’s not as big a growth as Ethereum, but tripling your money in 6 months is no small thing. So, you tell me, is Bitcoin or Ethereum a good investment? That may sound confusing, but it is. In theory, all you need is a computer and some mining software. However, Bitcoin is designed to mimic the real world. When a mineral is discovered somewhere, the first few months, it will be all over the place. You can even collect it on the ground. However, as the mining operation grows, the mineral starts getting exhausted and now you’re forced to dig deeper. So, can you mine Bitcoin with your laptop? Of course yes, but you’ll need a time machine to take you back to 2009. Since more players have come in, the difficulty has grown exponentially and now to mine Bitcoin profitably, you’ll need very specialized computers that may set you back many millions of Shillings. To get a sense of understanding, if you choose to mine with your normal laptop, lets say worth Sh50,000, you’ll need to keep it running every second, every minute, every hour of every day, for many many years, to get just 1 Bitcoin. By some 2016 estimates, it would take you 435 years on a high end laptop to mine 1 Bitcoin. The main reason is because the normal computer graphics card is not designed for this job, no matter how powerful it may be. Since Bitcoin has become a big business, majority of the coins are mined by just a few individuals/company, who have huge data centres with insane amounts of computing power, and millions of dollars in electricity bills. For 99.99999% of the world, their only option to lay their hands on some Bitcoin is to buy. Since mining is out of the question, how then do you acquire Bitcoin or Ethereum. The technology behind these coins may be almost 10 years old, but Kenya is yet to catch up. There are very limited ways you can buy Bitcoin or other alternative currencies from Kenya, without spending an arm and a leg. (Most options sell way above market price). Most coin exchanges online do not accept Kenyans, and the ones that do, require too much verification that does not even work in a Kenyan setting. But the purpose of this article is to show you how to. 2. Neteller or Skrill account. 1. Load your Neteller or Skrill account with the amount you want from your Visa or MasterCard. 2. Open an account with Spectrocoin (The only one I could find with reasonable verification requirements and Neteller/Skrill option). 3. You may still have to do some verification on Spectrocoin, like uploading your ID card. So have it ready. 3. Inside your Spectrocoin account, you’ll find an option to deposit via Neteller or Skrill. (Depositing via Visa/MasterCard might cause complications). 4. Once you have the amount in your Spectrocoin account, click the buy Bitcoin button. 5. It will be almost instantaneous, and your wallet will now indicate how much Bitcoin you own. (Doesn’t have to be a whole number. Can be something like 0.000245 Bictoin). 6. You can choose to leave the Bitcoin right there, but this is not advised since hacking is real and some of these websites keep going under. 7. Best choice is to store the Bitcoin in your local computer. For this you need a ‘Wallet’. 8. The best I’ve found is Exodus. It’s beautiful and easy to use. Plus it displays your ‘net worth’ in real time. 9. Once you’ve installed Exodus, click the deposit Bitcoin option, and your address will be displayed. 10. Go back to Spectrocoin and click send Bitcoin. Paste the Exodus address and enter the amouut of Bitcoin you want to send. 11. You Bitcoin will arrive in a few seconds and now Exodus will tell you how much they are worth in US dollars. 12. 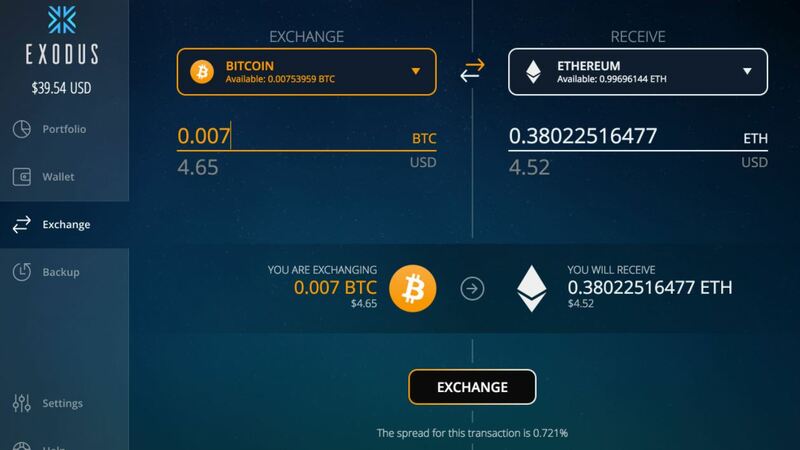 Inside Exodus, there is an option to exchange the Bitcoin for other coins. The developers promise to keep adding more coins, but currently you have an option of 6 coins. Luckily, Ethereum is one of them. 13. Click exchange and follow the prompts. You don’t have to exchange all your Bitcoin for Ethereum. Diversification is advised. 14. Protect the Exodus wallet by setting up a strong password. 15. Set up a back up mechanism in case your computer is stolen. (Click the Backup and restore button). 16. Depending on the amount of investment, consider buying an physical wallet (looks like a flash disk). Or maybe storing your bitcoin in paper format (there are websites for that). 17. Once again depending on your investment, consider renting a safe deposit box in a local bank. The likes of CBA and CFC Stanbic charge around Sh5000 a year for a box. Store your flash or paper wallet there. 18. Wait for the value to rise and use your instinct to sell at the best time. 19. At the moment, if you want to liquidate Ethereum, you’ll have to convert it back to Bitcoin. Use the same Exodus to accomplish this. 20. Neteller offers a good tool to covert Bitcoin to USD. The money gets deposited into your Neteller account. 21. The same Neteller can then send you the money via Mpesa instantly. Is This Guaranteed to Turn a Profit? There is no guarantee in life. But do not get into this hoping for quick money. This is a long game, and you should invest what you do not need right now. According to some estimates, Bitcoin has the potential to get to $100,000 in just a few years. Ethereum on the other hand is more of a platform that is seen to have more potential than Bitcoin. It is being adopted by many large companies, and everyone sees it as the future of the world. The likes of JP Morgan, Deloitte, intel, Microsoft, UBS, Samsung and many others. have come together to form the Enterprise Ethereum Alliance (EEA). Vitalik Buterin – its inventor, recently met Vladimir Putin, who gave his stamp of approval. And with everything, demand and supply will play the main role. For instance, at the beginning of the year, the entire market capitalization of all cryptocurrencies was about $25 billion. Right now, it stands at over $100 billion. That means more fiat money is coming in, pushing up the demand. So will the price keep going up? Your guess is as good as mine.